I went back a few years when digging for photos for this week's sketch at Creative Scrappers! I am trying to keep up with each year as I'm in it but sometimes I get the urge to reminisce and work on the "oldies". Anyway, these photos are of my daughter doing what she did best at the time...pulling the toilet paper off the rolls. I created this using Creative Scrappers sketch 219 and the Scrapbook Circle July 2012 kit, Sunshine Day. I faux stitched around the yellow distressed paper; the grid lines on the paper made it super easy to follow and keep my "stitching" in a nice straight line. Prior to adhering the layered pieces to the background paper, I cut some of the scallops out of the background paper and re-purposed them again over the yellow paper. I used wood circle frames to highlight the doily in the banner and the "memories" brad embellishment. It adds just the right amount of attention to those bits that might have gone unnoticed. I used actual toilet paper on my layout. I gave the toilet paper a scallop treatment by folding it in half again and again until it was the size of one scallop and then I cut a scallop with my scissors, like you do to make snowflakes. Then I ruffled them on the page under my photos. To make the word "innocent" stand out a bit more I outlined around each alpha and again over the top edge of the letters. oooooo i love this page. So soft and pretty. And such fun, what a great blackmail memory. bwahahahaha! LOL, such a cute page! Love that you used actual toilet paper on it too. Look at that innocent face :) Love all the layer and little details! Cute layout! I love the various details, such as the toilet paper (great use of it, btw!) and the outlining of the alphas. Those little touches can really make a layout a winner... and this is definitely one! Such a fun layout! Love that kit I used mine today. Great layout--those pictures are classic! Such a cute layout. My tp issue is with my dog. He grabs what he can from the back downstairs bathroom and runs it all into the dining room. We never find out until the next one has to use it. Such a beautiful layout! Little miss innocent is ADORABLE! Soooooooo cute!! LOVING those photos and the colors!!! Adorable layout! Love that you used TP on the layout and those photos are so very sweet! Really cute page! 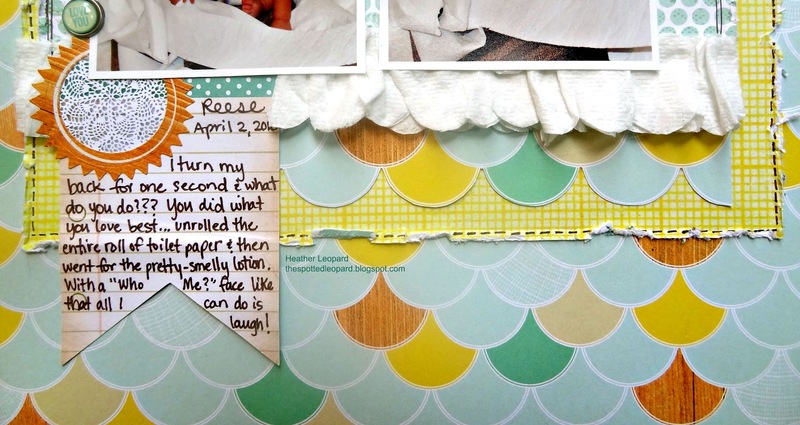 I see less and less about scrapbooking on blogs. Thanks for sharing yours! Adorable! I had forgotten that my kids used to do that! HA! We used to keep the toilet paper rolls high up rather than on the holder. Those were the days alright lol!